Summer in Ramsau am Dachstein has something for everyone. It’s great place to base yourself, whether you want to relax, be active or go out and about sightseeing. But having to stand in line and dig deep in to your pockets every time you visit an attraction can be very frustrating and expensive. That is now very much a thing of the past. Pension Haus Maria is a Sommer Card Partner. Stay with us during the qualifying period, even for just one night, and you will receive the Sommer Card absolutely free. over 100 free holiday experiences and a similar number discounted, the Sommer Card will enhance your holiday with us and take the strain off of your wallet. 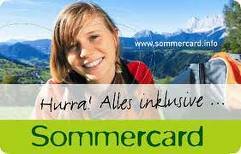 Check out the Sommer Card web site for full details of the free and discounted activities available to you. *minimum 2 night stay applies. 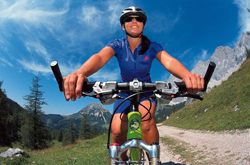 The Ramsau am Dachstein region offers specially constructed cycle paths, alpine footpaths and roads, for you to cycle through the wonderful countryside. Because Ramsau is set on a plateau there are cycle routes for all levels of ability from family outings to those who don’t mind going up as well as down. On the Planai there is a dedicated cycle route down from the top station of the Planaibahn, “if you’re brave enough”. 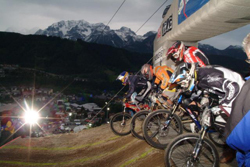 Schladming hosts the World Mountain Bike championships here each year. Available locally with English speaking guide and complete set of equipment i.e. 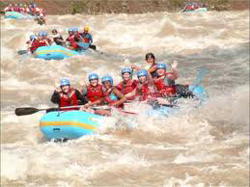 wetsuit, helmet, life jacket etc. You supply holiday spirit, bathing suit and a towel. 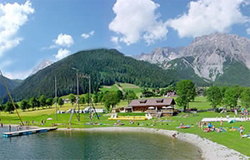 The "Ramsau Beach" at the foot of the Rittisberg is a wonderful playground for children with a 6000 m² bathing lake with toddlers' pool and diving board, a large sunbathing area, a beach volleyball court, a trampoline, a flying swing, sliding soccer plus table tennis, and a cafe. Yes, it’s a possibility on the Dachstein Glacier for most of the year. It does close during mid summer to preserve it. Check before travelling. If you’ve ever fancied taking to the air, as close to nature as you can, the local flying school would be pleased to make your dream come true. Here you can learn to fly or you can try out a tandem flight in the summer. 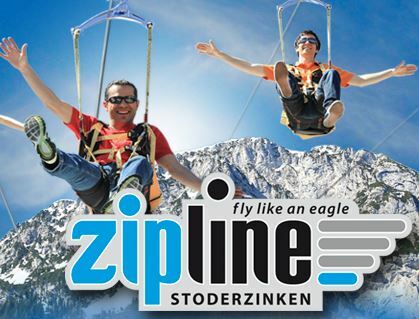 The dream of flying is as old as humanity and with the Zipline Stoderzinken you can now experience it! This is an experience not to be missed and is unique in Europe. 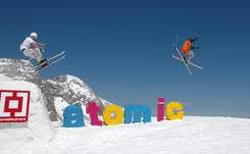 In gorgeous surroundings – on THE panoramic mountain in Schladming – Dachstein. Live your dream of flying – fast! Ramsau is initially a farming community, which is why many people are attracted here to the peace and tranquility of the countryside. So what better way to enjoy the countryside than on horseback? For horse lovers there are 200 km of bridle paths where you can ride from one picturesque farm to the next, and explore Ramsau to your heart's content. Pony trekking and rides out are available on many farms! Free with the Sommer Card for kids. 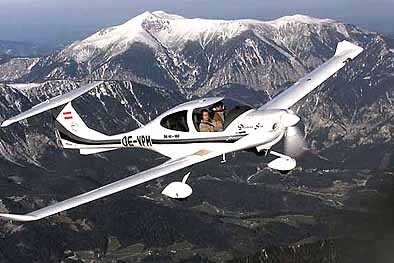 Flight Tours in motorised planes and motorised gliders. 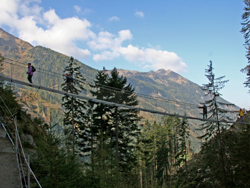 Come and see the magnificent waterfalls via stairways, paths and the suspension bridge. The Riesach Waterfall is the tallest in Steiermark (Styria). 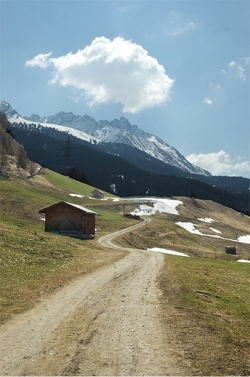 Ramsau in summer is a hikers paradise, the choices are many, and of varying difficulty. If it’s a ramble you are after there are circular walks on the Ramsau plateau, which you can leave and rejoin for all those refreshment stops you deserve. If you have a bit more energy there are various tracks that take you up the Dachstein mountain range “don’t forget to stop and enjoy the views, get your breath back pit stops”. From Haus Maria there’s a track that leads up to Guttenberg Haus and a crossroads of footpaths leading off in all directions to explore the Dachstein peaks. Another alternative is taking the cable car from Türlwand up to the Dachstein Glacier where you will find walks to many of the peaks in the Dachstein range. There are refreshments up here but you should go well prepared for peace of mind. If you are coming by car or motorcycle there are some great roads to explore. One of our favorites is the Grossglockner Straße. Probably the most well known alpine road in Austria. The 48 kilometers of high alpine road with an ascent of 2504 meters and 36 bends takes you to the Grossglocker the highest mountain in Austria standing 3798 meters above sea level. En-route there are loads of places to stop and pause for breath at the sheer scale of what lies before you. In all there are 12 visitors centres where you can learn about the history behind the building of the road, the glaciers and the natural beauty of the Hohe Tauern National Park. A great day out for all age groups.